You've positioned your microphones, set your levels and everyone's ready to record. Now, you need a way for each performer to hear themselves. 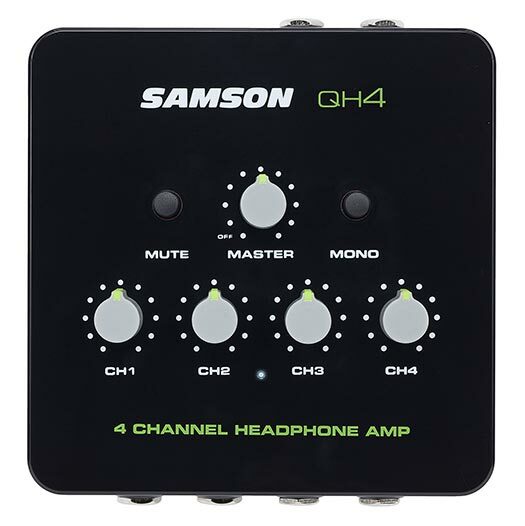 That's where the Samson QH4 comes in... The QH4 is a 4-channel headphone amplifier designed to distribute your audio to up to four individual headphones, each with its own volume control. Its compact design is perfect for use with any studio or desktop workstation, as well as with your laptop or smartphone when you're recording on the go. The QH4 features two balanced 1/4" inputs to connect with your mixer or recording interface, as well as a stereo 1/8" Aux input that's perfect for playing music via your smartphone or another line level device. In addition to the four stereo 1/4" headphone outputs, the QH4 provides a 1/8" Aux Out that can be used to daisy chain mutilple QH4s together. The four independent high-power amplifier channels deliver clean, crisp audio to up to four sets of headphones, operating between 16–600Ω. And power does not diminish even when all four channels are being used. Engineered with an ultra-low noise floor and wide dynamic range, the QH4 is a tremendous value compared to other headphone amplifiers on the market. Also, the QH4's Master volume control and Mute switch make controlling the overall level of your headphones a breeze. Before bouncing your mix, you should always check to ensure that it's compatible with mono speaker systems. 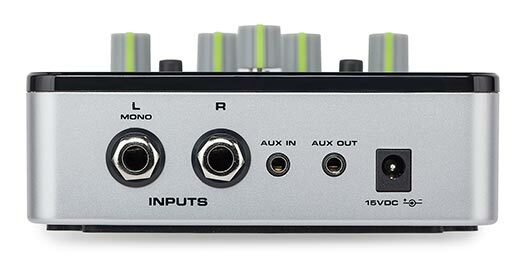 The QH4 features a global Mono button, which allows you to quickly check the mono compatibility of your tracks. If you notice that some of your audio is missing, you should check the phase of your recordings. This feature also allows you to take a split left and right feed from a stereo interview and send both tracks to each side of your headphones. 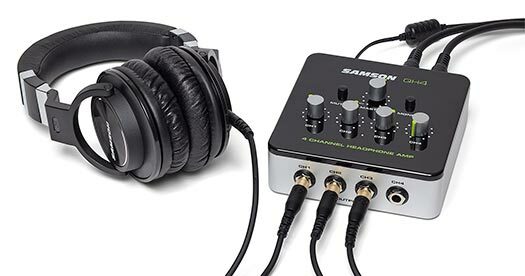 This is great for quickly monitoring a podcast or recording with split tracks. Whether you're tracking multiple performers in a studio, recording a podcast, watching a video with friends or just kicking back listening to some tunes, the QH4 provides great sound at an amazing value.